So I’ve talked before about the importance of kids’ books for teaching language to children, but there’s also a lot to be said for using literature to transmit values. I believe we need to be intentional about what we read to our children. By this I am referring both to what we choose to read and what we choose not to read. I could rail against all the garbage being written for kids these days (and always, it’s not all new), but in the interest of keeping things positive I’m going to just mention one valuable story we read in my house recently. We love Frog and Toad (you know that already, though, because I mentioned them in my last post, too) and recently got Frog and Toad All Year from the library. My absolute favorite story in the book, and the inspiration for this post, is The Surprise, in which Frog and Toad each secretly rake each other’s leaves. They each independently come up with the idea and do the good deed in secret. Then the wind blows all the leaves out of the piles, undoing their hard work; when each returns home, he finds his own yard a mess and never knows what the other did for him. 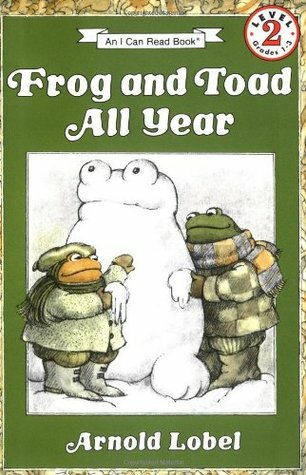 The best part of the story is that Frog and Toad each go to sleep that night happy to have helped a friend, never finding the need to take credit for it. Each of them is happy just to have done a good deed, without needing or seeking credit. This is love in its truest sense – seeking the good of another just for the other’s sake. I’m not sure if my kids understand the message of the story, but it has certainly served as a reminder for me to check myself every time I want to say to someone, “oh, hey – did you see this nice thing I just did for you?” I know that books teach us (there’s a reason I called this blog “The Edifying Word”), but reading The Surprise was, for me, a reminder of the power of stories teach values and not just facts. I’ve generally been pretty good at screening out the “bad” from what my kids read (at home, anyway – I can’t control that my daughter’s teacher reads Junie B. Jones with all her sass aloud to the class). My goal going forward is to remember the power of teaching positive values rather than just avoiding the things I don’t approve of, and using that as a guide for choosing what we read. We learn by repetition, and if I repeatedly and intentionally expose my children to the values I want to instill in them, they will absorb the message; literature is one of many tools I have as a parent to do so. What do you think? Any suggestions of other positive, edifying books for kids? Have you heard anything about the Kindness Club books by Courtney Sheinmel? We haven’t read them yet, so I can’t offer a personal stamp of approval, but they sound like they might be what you are looking for!